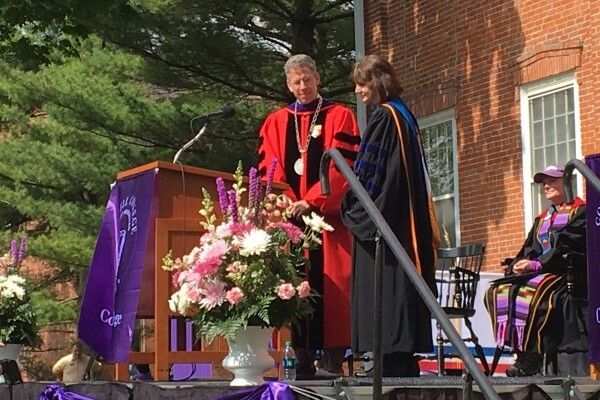 Professor of Psychology Carol Zerbe Enns received an unexpected honor at Cornell College’s 2016 Commencement ceremony when she was announced as the recipient of the Exemplary Teacher Award. Professor Carol Zerbe Enns has been teaching at Cornell College since ’87. Dean of the College Joe Dieker makes the decision with input from President Jonathan Brand and the Faculty Development Advisory Committee. Dieker said Professor Enns is a treasured faculty member. Professor Enns teaches many classes for the Ethnic Studies and Gender, Sexuality, and Women’s Studies programs. She is a leader in her field and has received numerous awards, most recently the Florence L. Denmark and Mary E. Reuder Award for outstanding international contributions to the psychology of women and gender (2013, American Psychological Association Division of International Psychology). Enns has written approximately 60 articles and chapters that focus on gender, pedagogy, and feminist theory and psychotherapy. Carolyn is also the author of “Feminist Theories and Psychotherapies” (2004) and co-editor of “Teaching and Social Justice” (2005), “The Oxford Handbook of Feminist Multicultural Counseling Psychology” (2013), and “Psychological Practice With Women: Guidelines, Diversity, Empowerment” (2015). She is a Fellow of the American Psychological Association and Midwestern Psychological Association. The General Board of Higher Education and Ministry of the United Methodist Church offers the award for its affiliated colleges. Last year the recipient was Associate Professor of Theatre Jim VanValen. The recipient receives $1,000 with $500 of it from the United Methodist Church and $500 from Cornell College. Dieker said this is a good time to honor Professor Enns because she is moving into phased retirement in the coming year.